History and Historical fiction are two of my favorite literary genres. This is the first time I picked up a book on Egyptian history. This is the story of Queen Nefertiti’s life narrated in first person by her half-sister Mutnodjmet. It is 1351 BCE. Nefertiti and Mutnodjmet are brought up in one of Egypt’s first families. After Tuthmosis is dead, his brother Amunhotep, who is rumored to have killed Tuthmosis, becomes the next Pharaoh. However, Amunhotep is not considered very stable. He believes in Aten, a smaller god instead of Amun, who has been worshipped by the people of Egypt for centuries. Hoping that Nefertiti’s strong personality will tame Amunhotep, Nefertiti and Amunhotep are married. But Nefertiti soon gets carried away by her own ambitions to be the most powerful queen in Egypt. She starts giving in to her husband’s ambitious plans to build a city in the middle of the desert, turning a blind eye to all the political unrest that is brewing in Egypt. This book is not all about Nefertiti but also about Mutny’s life. She is Nefertiti’s closest friend and confidante. But their lives and what they want from it are completely different. Mutny wants a quiet life with her herbs far from the palace, whereas Nefertiti wants power. She resorts to unfair politics and soon rises to become the co – regent or Pharaoh. Mutny ends up feeling trapped in her famous sister’s shadow and unwillingly, becomes her handmaiden. I cannot comment on how well the author has researched to write this book, simply because I don’t know much about Egyptian history. The story unfolds in a very interesting way. You end up feeling both angry and sorry for Nefertiti. She is a very strong, shrewd woman who at times is very vulnerable, which is when she confides in Mutny. Mutny faces the eternal dilemma of whether to support her sister, whose actions she doesn’t approve of or do what her heart desires. The author brings out the complexity of characters beautifully, which makes this book a pleasure to read. 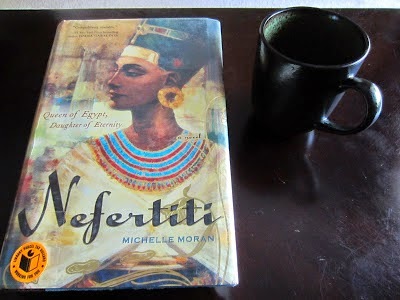 ‘Nefertiti’ has definitely whet my appetite for Egyptian history. Next on my ‘to-read’ list is ‘The Heretic Queen’. Review coming soon!